Matthew Mitchell Member General Court, Hartford, Mch. 8, 1637. Matthew Mitchell, Member General Court, Hartford, Apr. 5, 1638. VIII (2) SAMUEL SHERMAN, JR., son of Hon. Samuel and Mary (Mitchell) Sherman; born June 19, 1641, at Stratford, Ct.; died Feb. 20, 1718/19, at Stratford; married June 19, 1665, at Stratford, Mary Titterton (sometimes spelled Titharton), dau. of Daniel and Jane Titterton, who was born in Stratford and died there. 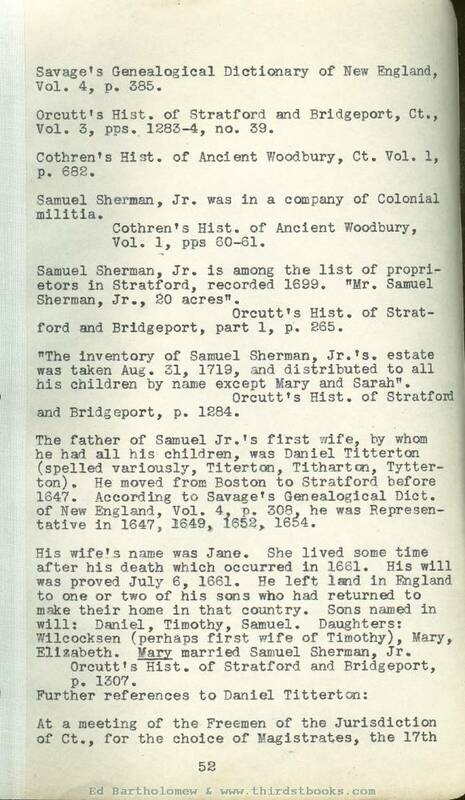 Same authorities say that Samuel, Jr. was bom in Stamford before his father went to Stratford but his birth is in Vital Statistics of Stratford, vol. 1, p. 54.
i. Mary, b. May 7, 1666. Died young. ii. Daniel, b. Mch. 23, 1668, in. Rebecca Wheeler, Dec. 19 or 26, 1694.
iii. Susanna, b. July 22, 1670, m. Daniel Mitchel. iv. Sarah, b. Jan. 26, 1673, bapt. May 16, 1673, probably died young. v. Grace, b. July 8, 1676, m. Daniel St. John. vi. Elizabeth, b. June 1, 1678, m. Isaac Clark. vii. Sarah, b. Dec. 16, 1681, m. Samuel Beers. viii. Abigail, b. Aug. 4, 1688, m. James Beebe. After the death of his first wife, Samuel Sherman Jr. married a second time, Aug. 1, 1695 at Stratford, Ct., Abigail (Thompson-Curtiss) Huse. She survived him, dying Mch. 2, 1731, at Stratford. 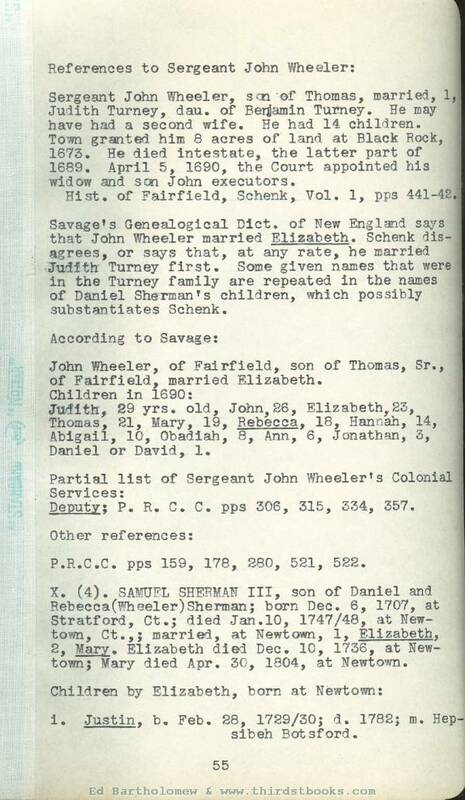 Savage's Genealogical Dictionary of New England, Vol. 4, p. 385. Orcutt's Hist. of Stratford and Bridgeport, Ct., Vol. 3, pps. 1283-4, no. 39. Cothren's Hist. of Ancient Woodbury, Ct. Vol. 1, p. 682. Samuel Sherman, Jr. was in a company of Colonial militia. Cothren’s Hist. of Ancient Woodbury, Vol. 1, pps 60-61. Samuel Sherman, Jr. is among the list of proprietors in Stratford, recorded 1699. "Mr, Samuel Sherman, Jr., 20 acres". Orcutt's Hist. of Stratford and Bridgeport, part 1, p. 265. "The inventory of Samuel Sherman, Jr’s. estate was taken Aug. 31, 1719, .and distributed to all his children by name except Mary and Sarah". Orcutt’s Hist. of Stratford and Bridgeport, p. 1284. The father of Samuel Jr.'s first wife, by whom he had all his children, was Daniel Titterton (spelled variously, Titerton, Titharton, Tytterton). He moved from Boston to Stratford before 1647. According to Savage’s Genealogical Dict. of New England, Vol. 4, p. 308, he was Representative in 1647, 1649, 1652, 1654. His wife’s name was Jane. She lived some time after his death which occurred in 1661. His will was proved July 6, 1661. He left land in England to one or two of his sons who had returned to make their home in that country. Sons named in will: Daniel, Timothy, Samuel. Daughters: Wilcocksen (perhaps first wife of Timothy), Mary, Elizabeth. Mary married Samuel Sherman, Jr.
Orcutt's Hist. of Stratford and Bridgeport, p. 1307.
of May, 1649, "Danyell Titterton" was appointed by the court to survey "a percell of land" bought by Fairfield from the Indians. Public Records of the Colony of Connecticut, p. 189. Report of above survey submitted at a session of the General Court, May 21, 1650. P.R. C.C. p. 208. 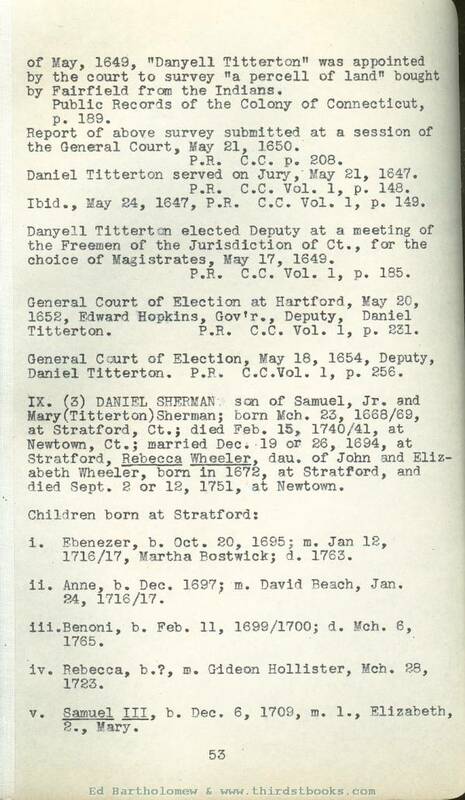 Daniel Titterton served on Jury,' May 21, 1647. Ibid., May 24, 1647, P.R. C.C. Vol. 1, p. 149. Danyell Titterton elected Deputy at a meeting of the Freemen of the Jurisdiction of Ct., for the choice of Magistrates, May 17, 1649. P.R. C.C. Vol. 1, p. 185. General Court of Election at Hartford, May 20, 1652, Edward Hopkins, Gov'r., Deputy, Daniel Titterton. P.R. C.C. Vol. 1, p. 231. General Court of Election, May 18, 1654, Deputy, Daniel Titterton. P.R. C.C. Vol. 1, p. 256. IX. 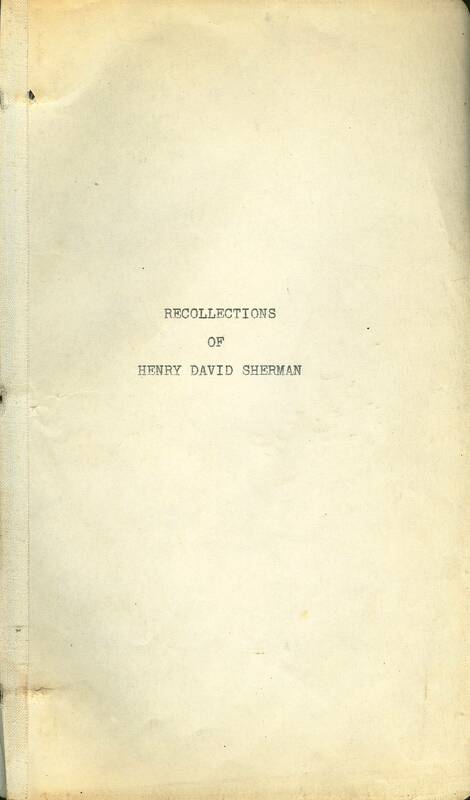 (3) DANIEL SHERMAN son of Samuel, Jr. and Mary (Titterton) Sherman; born Mch. 23, 1668/69, at Stratford, Ct.; died Feb. 15, 1740/41, at Newtown, Ct.; married Dec. 19 or 26, 1694, at Stratford, Rebecca Wheeler, dau. of John and Elizabeth Wheeler, bom in 1672, at Stratford, and died Sept. 8 or I2, 1751, at Newtown. i. Ebenezer, b. Oct. 2O, 1695; m. Jan 12, 1716/17, Martha Bostwick; d. 1763.
ii. Anne, b. Dec. 1697; m. David Beach, Jan. 24, 1716/17. iii. Benoni, b. Feb. 11, 1699/1700; d. Mch. 6, 1765.
iv. Rebecca, b. ?, is. Gideon Hollister, Mch. 28, 1783.
v. Samuel Ill, b. Dec. 6, 1709, m. 1., Elizabeth, 2., Mary. Daniel appears as a selectman in Newtown, 1738. Genealogical Section of Johnson’s Hist. of Newtown, p. I30. Orcutt's Hist. of Stratford and Bridgeport, Ct., Vol. 3, p. 1284, no. 64. Cothren’s Hist. of Ancient Woodbury, Ct., Vol. 1, pps. 683, 684. Savage's Genealogical Dict,, of New England, Vol. 4, p. 498. Deaths of Daniel and Rebecca are recorded in Vital Statistics of Newtown. Rebecca (Wheeler) Sherman was a daughter of Sergeant John Wheeler, and granddaughter of Lt. Thomas Wheeler. Thomas Wheeler, Sr. (he had a younger brother of the same name, Thomas, Jr.) was born in England. He was early at Concord, he removed to Fairfield, Ct. His will is given, in which his son, John, sole executor, is left all his Fairfield estate. Hist. of Fairfield, Schenk, Vol. 1, pps. 421-22. Lt. Thomas Wheeler of Fairfield appointed "Ensigne" of a company of 65 soldiers to be used "if God call the Colonyes to make War against the Dutch". P.P.. C.C. Vol. 1, pps 241 (footnote), 243. Other references to Thomas Wheeler’s Colonial services are found in P.R. C.C., pps 105, 107, 127, 155, 209, 233, 256, 524, etc. 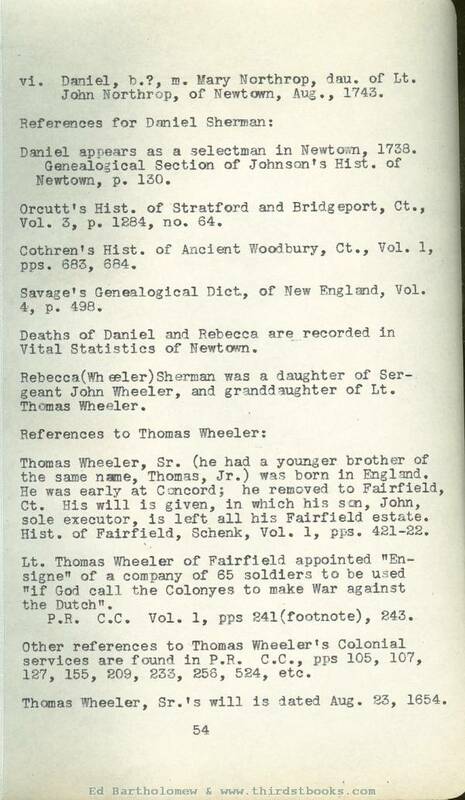 Thomas Wheeler, Sr.*s will is dated Aug. S3, 1654. Sergeant John Wheeler, son of Thomas, married, 1, Judith Turney, dau. of Benjamin Turney. He may have had a second wife. He had 14 children. Town granted him 8 acres of land at Black Rock, 1673. He died intestate, the latter part of 1689. April 5, 1690, the Court appointed his widow and son John executors. Hist. of Fairfield, Schenk, Vol. 1, pps 441-42. Savage’s Genealogical Dict. of New England says that John Wheeler married Elizabeth. Schenk disagrees, or says that, at any rate, he married Judith Turney first. Some given names that were in the Turney family are repeated in the names of Daniel Sherman's children, which possibly substantiates Schenk. John Wheeler, of Fairfield, son of Thomas, Sr., of Fairfield, married Elizabeth. Children in 1690: Judith, 29 yrs. old, John, 26, Elizabeth, 23, Thomas, 21, Mary, 19, Rebecca, 18, Hannah, 14, Abigail, 10, Obadiah, 8, Ann, 6, Jonathan, 3, Daniel or David, 1. Deputy; P. R. C. C. pps 306, 315, 334, 357. P.R.C.C. pps 159, 178, 280, 521, 522. X. (4). 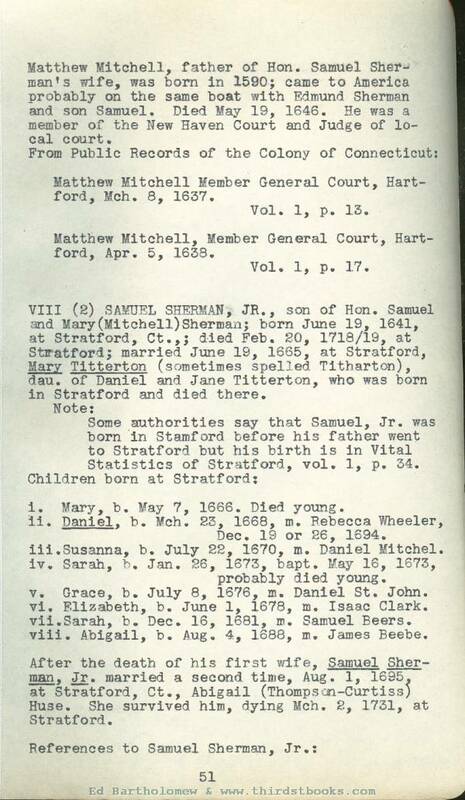 SAMUEL SHERMAN III, son of Daniel and Rebecca (Wheeler) Sherman; born Dec. 6, 1707, at Stratford, Ct. died Jan. 10, 1747/48, at Newtown, Ct.; married, at Newtown, 1, Elizabeth, 2. Mary. Elizabeth died Dec. 10, 1736, at Newtown; Mary died Apr. 30, 1804, at Newtown.